4-6 Months of Age: Your kitten is reaching an age of adolescence and therefore, sexual maturity. This will result in an increase of energy and at times, behavioral changes similar to an adolescent human child entering puberty. How to take care of a kitten during this phase includes continuing hands-on bonding-based playtime with the addition of behavior modification if necessary. There are many ways to enrich your cat's environment which is especially important for indoor kittens. During your next visit we should discuss ways to build an enriched environment that provides the right amount of stimulation your kitten instinctively desires. At approximately six months is the time to plan for your kittens to be spayed or neutered. Most kittens will go through puberty at approximately 6-8 months and it is recommended that they are spayed or neutered just before then to avoid unwanted kittens. Feeding kittens the right food in the right amounts, and at the right times throughout the day is essential for happy, healthy and growing cats. Our veterinary staff would be happy to discuss the proper feeding schedule for your kitten at your next veterinary visit. We realize that human parents of newborn kittens are prone to being over sensitive and cautious, and this is actually a good thing. In fact, it shows how much you care about your new furry companion. However if you observe any odd or concerning behaviors during kitten development, don't hesitate to bring your kitten in for a special visit in addition to the veterinary appointments that should be maintained for preventive purposes and kitten vaccinations. No matter when you get your kitten, you should visit your veterinarian within the first week. Early and frequent visits will help socialize your kitten with your vet, and help the vet establish an informed baseline for your kitten's health and wellness. All kittens need a regular deworming program which includes medication to kill most intestinal parasites. In addition, we will want to check your kitten's stool for more uncommon but potentially serious parasites. In addition to intestinal parasites/worms, cats can contract heartworms. 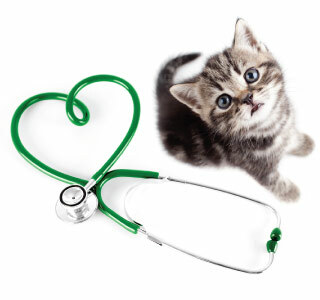 If cats develop heartworm disease, there is no treatment. Therefore we recommend Revolution heartworm prevention for all cat patients. Of all threats to your kitten, one of the most common and annoying parasitic dangers is fleas. A discussion about your cat's lifestyle and proper flea and tick control is an indispensable component of kitten care. We do not recommend over-the-counter sprays, powders and collars. They are less effective and more toxic to your kitten. At your next visit we would be happy to discuss an effective flea/tick and overall parasite prevention program. Avoiding a possible deadly infection of the uterus called pyometra. Visit Lowell Animal Hospital Today! At Lowell Animal Hospital kitten care is one of our greatest joys. Our veterinary staff would be delighted to spend some time with you and your kitten ensuring that your relationship will be a healthy, happy and rewarding one for many years to come. Come in during our office hours to see one of our veterinarians!